I love simplicity in tapas. I normally go for chorizo cooked in sherry (obviously! ), Manchego cheese and quince jelly, slices of Ibérico ham, a finely layered potato tortilla, some marinated anchovies, maybe a ham and cheese croquette, padron peppers,pan con tomate and if there is a nice octopus dish...ok, ok...it's pretty easy to get carried away. 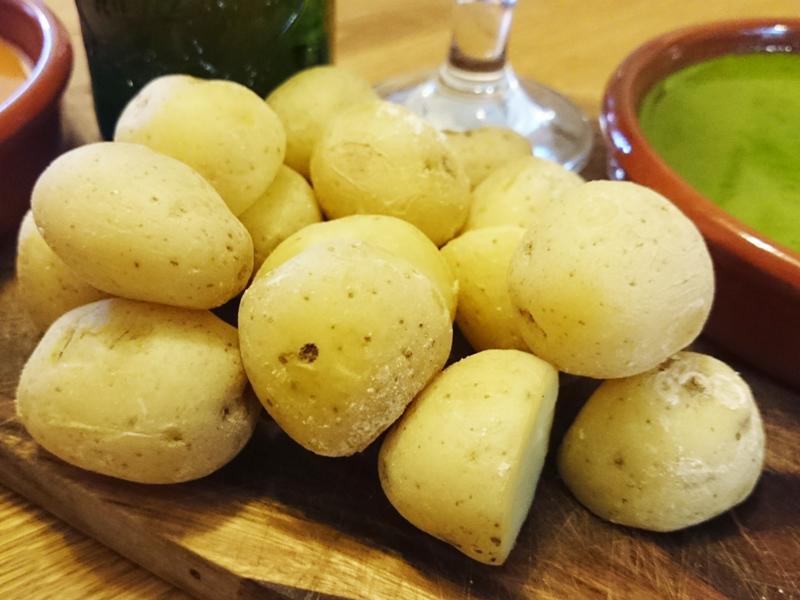 But one dish I do like, which is rarely on the menus, is Papas Arrugadas with Mojo sauces. This is regional to the Canary Islands and something I discovered with Mr Graphic Foodie back in the day when we were young, carefree and wrecking our cheap 1ltr white Nissan Micra by driving it off road to Playa de Papagayo. And when we weren't breaching our car hire lease conditions, we were propped up somewhere, ordering these wrinkly potatoes with a salted crust, dipping them in fiery mojo sauces. They really are one of best holiday food memories I have. And as Alhambra were nice enough to send over a case of their Alhambra Reserva 1925 beer, I thought I'd remember what summer was like (is it EVER going to stop raining?) and recreate that holiday vibe. 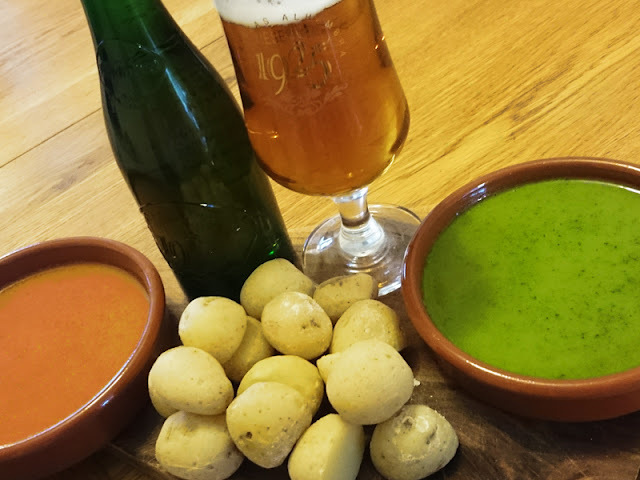 There are so many variations of mojo sauces but I've stuck to the two classics of spicy red and smoother parsley mojo sauce but you can try avocado or orange based ones too. 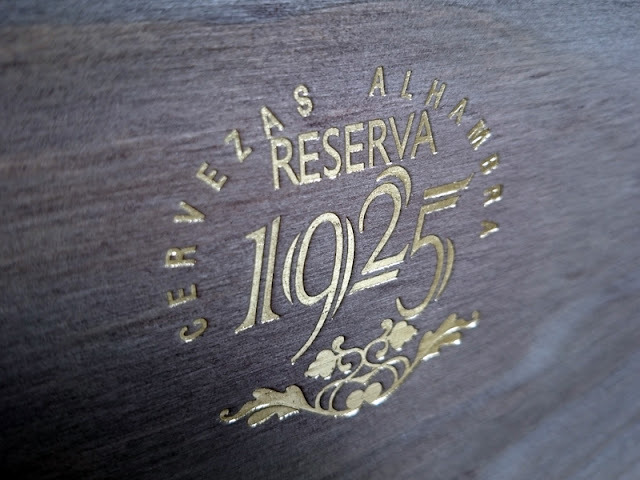 Although not much of a beer drinker, I really enjoyed the Alhambra Reserva 1925. Crisp, premium and really full bodied flavour. It was actually quite elegant. It was also refreshing to drink something traditional and not from the neue craft beer genre with zany labels and pumped up social media feeds. Anyway, I loved it and you can try it too by winning a heritage set of Alhambra Reserva 1925 beer yourself - see the end of post for details. Put the potatoes into a pan with the salt and water and bring to the boil. Reduce the heat and simmer for 25-30 minutes until the potatoes are tender. Drain off any excess water and allow to steam dry slightly. Place on a baking tray and bake in the oven for 15 minutes, until the skins have started to wrinkle and the potatoes get a slightly crystallised coating from the salted cooking water. To make the sauces, just place all of the ingredients into a processor and process until a sauce has formed. Do this for each version. 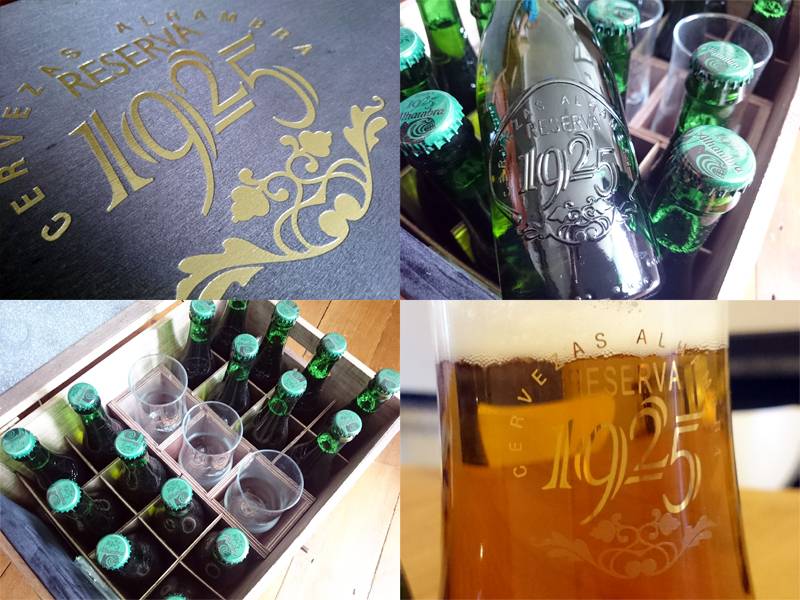 I was sent a case of Alhambra Reserva 1925 beer for review. Opinion and content, as always, are my own.